Christmas cookies…yes please! 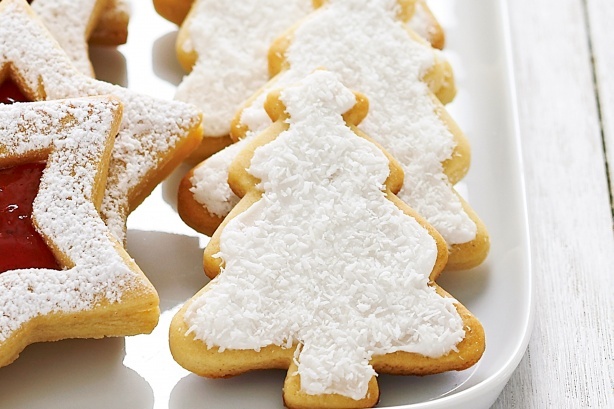 Try out this Honey Christmas cookie recipe…oooo….yum! Step 1: Line 2 baking trays with baking paper. Using an electric mixer, beat butter and icing sugar mixture in a bowl until pale and creamy. Add honey. Beat until well combined. Step 2: Place flours, cinnamon and milk in a bowl. Add butter mixture. Mix until dough begins to form. Turn onto a well floured surface. Knead gently until smooth. Divide dough in half and wrap each portion in plastic wrap. Place in the fridge for 15 minutes. Step 3: Preheat oven to 160C(320F). Using a well floured rolling pin, roll one portion of dough out on a well floured surface until 5mm-thick. Step 4: Using an 8.5cm Christmas tree cutter, cut out biscuits. Place on prepared trays. Bake,swapping trays halfway during cooking, for 10 to 12 minutes or until crisp and golden. Cool on tray for 5 minutes before transferring to a wire rack to cool completely. Repeat with remaining dough. Step 5: Make glace icing: Using a wooden spoon, lightly beat egg whites. Sift icing sugar over eggwhite. Stir until smooth. Add lemon juice and stir until well combined. Step 6: Spread biscuits with icing, leaving a 2mm border. Sprinkle with coconut. Set aside for 1 hour to set. Serve or gift wrap. Next Dark Chocolate Manuka Honey Mints!